are several things to take into consideration. Time, commitment, and professionalism are at the top of the list. Essentially, you will be a small business owner, regardless if you hire employees or go it alone. Keeping that in mind, where does one begin in regards to starting up a business? Here are five things to consider before taking the leap. Filing for a business license can be a daunting task for many, but it’s not as scary as it seems. Check with your state whether you need a business license to legally operate a pet-sitting business. They will let you know what paperwork to file to get your business off the ground. Do you want to use your own name, or a business name? (ie. Pam’s Pet-sitting vs. Walk in the Park) If you choose to name your business, you’ll need to register that name with the appropriate authorities. This process is known as registering your “Doing Business As” (DBA) paperwork. Registering your DBA is done either with your county clerk’s office or with your state government, depending on where your business is located. 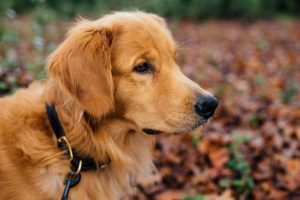 What if, while in your care, Fido bites another dog or a child? Or you accidentally break a client’s favorite antique? As a business owner, you’re liable. Accidents happen, so it’s a good idea to protect yourself. Pet-sitting insurance covers general liability, personal property, and employee accidents or dishonesty. There are several insurance companies that offer pet-sitting insurance. The cost will vary, but it’s worth it. Using a personal account for your business finances affects your legal liability. If you’re a sole proprietor and combine business and personal expenses, it can be difficult for the IRS to determine if you’re a viable business. If you choose to operate from your personal account, make sure to keep track of your business and personal expenses. If your business is an LLC, partnership, or corporation, it’s crucial to have separate accounts. Failure to separate business and personal expenses can result in the owner being sued for business and corporate liabilities. Check with your bank to see what they offer in terms of small business accounts. Business contacts who have access to your personal phone number can create privacy concerns. Having a separate business line gives you the ability to answer the phone and return calls in a professional manner. You can also set up business hours (although if you’re taking care of someone’s pet, I recommend being available to them at all times). If you decide to use your private number, be prepared. Clients will treat the number as a business number, and may be calling at all hours. Make sure your voice message states when you’ll be returning their calls. Having a local and online presence is important. If you aren’t tech savvy, find someone who is that can help you. It’s also a good idea to check out your local pet-sitters to see how their websites are designed, and what they offer their clients. Logos: Design a logo to represent your business. Your logo will brand your website, business cards, online advertising and flyers. Make sure your images aren’t copyrighted or you could be sued. You can use clip art or search for Creative Commons images online. From there, find a photo editing/designing program (PicMonkey, Fotor) and create something memorable. The possibilities are endless, have fun with it! Website/Domain name: Depending on your business needs, a website/domain name can be free (Weebly, WordPress, Blogger) or paid (Wix, iPage, GoDaddy). Pay careful attention to introductory web hosting prices, as they will most likely increase after the first month. Again, if designing a website isn’t your thing, find someone who can help you. Business cards and flyers: Leaving business cards and flyers with your local veterinarians, pet shops, animal-related events, shelters, and dog parks is a great way to spread the word about your business. Don’t forget to advertise in your local online directories. With some thought and planning, starting up your own pet-sitting business is a wonderful venture. Getting involved with a pet-sitting organization to learn from others and network is a step in the right direction. Good luck! Ready to take your pet business to the next level? PetsitUSA is sponsoring the upcoming online pet business conference! It’s a virtual event and you can attend from wherever you are in the world…and it’s at no cost to you. Many top pet business experts will be speaking including Victoria Stilwell, Ian Dunbar, Beth Stultz from Pet Sitters International and many more speakers at the upcoming Prosperous Pet Business Online Conference hosted by Kristin Morrison. The goal of the conference is to inspire pet business owners to break through problems, get unstuck, and move forward on business goals. In short, to empower you to fulfill your dream of working with pets for a living. Kristin’s conference has a unique format. It’s no charge (woo-hoo! ), international (cool! ), and comprised of a series of informative interviews with all sorts of experts in the business and pet field. And the conference is online so you can attend regardless of where you are in the world. You’re sure to take a gem away from each of these informal chats, each one built around the theme of making more money while experiencing more ease and more freedom (nice!). All the details you need are here: Prosperous Pet Business Online Conference. As pet owners, we are responsible for maintaining our pet’s health. Part of that is ensuring that they are safe and warm during the cold season. Jordan Walker, the lead content curator of Coops and Cages, shares tips on how you can accomplish this. 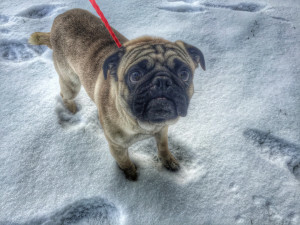 Dogs like the winter season just as much as their owners do. In the same way, however, they are also affected by the cold when they are outside frolicing in the snow. In addition, not all dogs are used to the cold and have sufficient fur for protection. As such, it is important to think about their well-being when the cold season starts. Here are some ways you can protect your dog from the cold. Technically, the best solution to a cold draft is to keep your dogs inside the home. In order to keep them from bustling with energy, take them out for exercise and walks, but never leave them outside, especially when the temperature drops. Keeping oneself warm takes a lot of energy. With that, dogs are expected to need more food and water for such occassions. The water should be checked regularly as it can freeze over time, leaving the pet thirsty and unable to help themselves. If you feel that you must leave them outdoors, there are certain requirements needed in order for them to brave the cold. Ideally, the ceiling of their outdoor shelter should be 2 to 3 inches taller than the dog’s sitting height. Likewise, it is advised to have an interior that is 36 square inches for every 1 inch of dog height. It would also do to have the entrance off-center. This way, the dog can curl up in one corner, far away from the opening. If there is another building on the property, such as a garage or shed, that would make a better place to house the shelter rather than the bare ground. • Foot wax – Dogs paws are always in contact with the ground. During winter, it becomes all the more important to protect these. Foot wax or paw wax is a great way to keep their paws soft and pain free. This is especially helpful when the dog is always mobile, such as during walks. On the other hand, pet safe salt should be spread across the driveway if the dog is simply at home. 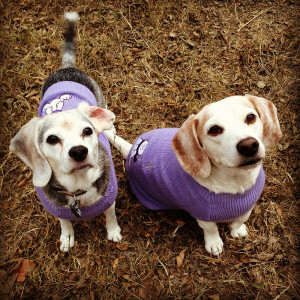 • Coats/sweaters – Dog coats and sweaters are really nifty to have. During regular days, you can use them to accessorize your dog when taking them out for walks. For the cold season, these make great buffers between them and the extreme cold. 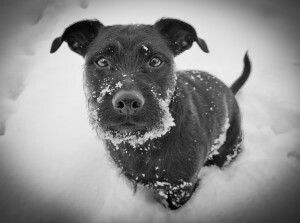 There are numerous ways to tell if a dog is suffering from hypothermia. The biggest telltale sign is that their temperature gets really low and they start shivering. Also, their pupils start dilating and their breathing visibly slows down. When this happens, be sure you are there to warm your dog up right away. If you need to be away, be sure you leave them blankets and towels so that they can help themselves. Jordan is the lead content curator for Coops and Cages as well as other pet-related blogs. His passion for animals is matched with his passion for “attempting” to play the guitar. If you would like to catch more of him, you can visit his Google+ or Twitter accounts. Here’s an interview of Lori, owner of PetsitUSA’s 2015 featured pet sitter, I’ve Got the ‘Scoop’!, LLC. Thank you, Ryan! It’s very exciting being interviewed by PetsitUSA and having the opportunity to help new pet sitters by sharing my experiences and insight. Can you give us a little background about yourself? ily. I ignored it all, and I’m not going to offer that advice, because the benefits of owning a business allows each of us, as individuals, to make decisions based upon our personal goals, abilities, threshold, ethics and devotion to our pet parents and furry babies. Our circumstances vary, from familial responsibilities, some transition from another profession still working another job, while others have no time constraints or limitations. The most important consideration is determining the needs of your clients and their beloved pets, because that’s why we become professional pet sitters: To provide care needed for animals in the absence of a parent and/or when a parent requires our assistance with their pet. Because my dedication is extreme and I lacked the ability to say “no,” implementing policies was necessary. That is one suggestion I strongly recommend; have policies in place you are comfortable with, review them with clients, and have each client acknowledge acceptance of the terms by way of their signature so there are no miscommunications. I adhere to my policies; however, there are situations warranting my waiving them without hesitation. Change and restructuring typically means acquired knowledge and growth, not errors or poor decisions! 2015 was my fifth year providing love, enrichment and comprehensive pet care for furry babies with my pet sitting business, I’ve Got the ‘Scoop’!, LLC. It has been a very rewarding year professionally with awards, recognition, community outreach events and expanding my non-profit volunteer efforts. Unfortunately, working independently leaves minimal time to celebrate these accomplishments. Being a recipient of NAPPS’ 2015 National Pet Sitting Business of the Year Award, and Winner of “The Best” Pet Sitter & Dog Walker of Burlington County, in The Best of Burlington County Times 2015, were both amazing honors I cannot believe I received! I work endlessly and my devotion is second to none; still, to be nominated and voted for by clients, colleagues and the community are most cherished honors! Another wonderful compliment was becoming a Board Member of the Boo Tiki Fund, a non-profit charity whose mission is to leave no pet without veterinary care. Families experiencing grave financial hardships may receive a grant for their pets’ urgent medical needs. past two years and am looking forward to the third annual event on April 16, 2016. It’s a fundraiser and powerful learning experience for all attendees. Elite veterinarians volunteer their time and present educational lectures to pet professionals, parents, animal welfare heroes and members o f the community alike, and some of the lectures incorporate live animals for a hands-on learning experience. Pet businesses have an opportunity to showcase their services, also. Last year’s symposium included a children’s component with a Bite Prevention class presented by fellow pet sitters, Endless Pawsabilities, reading with the Furry Angels Therapy Dogs, and a community service workshop to benefit FOBCAS and homeless animals at the Burlington County Animal Shelter. A particularly fun event I planned the past three years has been the Spooktacular Pets of our town’s annual Halloween Parade, facilitating community members of all ages to participate in the festivities, even if their children have fur! Animal lovers have the opportunity to walk with the doggies, and it’s a safe alternative for children and pets to enjoy a fun-filled family event! Most recently, I started KiSS!, a Kitty Sponsorship Series, helping senior and fragile homeless kitties KiSS! their cages at a shelter and life in rescue goodbye, by sponsoring their adoption fees. Another rewarding endeavor was raising money to donate 14 Fido Bags to local fire departments and first responders through the Fetch Foundation. Although I organize and host many events, they’ve only been possible thanks to relationships I’ve established through volunteering and networking, having cultivated amazing collaborative efforts to benefit animals in need and those who love them. I could never have accomplished these myself, and I thank the Borough of Palmyra, NJ, for their assistance in making these events possible. But life and business are not always happy, happy and success, and a professional pet sitter must always have a solid backup plan in place for unforeseen emergencies. 2015 has been most challenging personally, having a scare with breast cancer, working with great physical pain, enduring procedures on my neck and back, and facing far too much loss. The devastation of losing furry babies for whom I provide care is what I find to be the most difficult aspect of pet sitting. My precious kitty, Simon, the love of my life, began having seizures and was diagnosed with hypertension and renal disease. That weekend my father died suddenly. Recently, both my mother- and father-in-law were diagnosed with cancer, and just a couple months ago, my very special, one -of-a-kind, Simon, became an angel. He was incredibly loving and a tremendous support to me and my son. I don’t typically shout out about myself, but it’s important to know this can be you and so much more! Always remember, because of you, pet parents are able to create wonderful memories, be available for work and familial responsibilities, and have peace of mind to walk out the door leaving their furry babies behind. Always feel honored you were chosen by each parent and be thankful you have the opportunity to care for their beloved pets. My wonderful son, Billy, was diagnosed with diabetes at the age of 18. He has significant special needs, and because of his cognitive challenges and inability to care for himself, let alone the continuous monitoring of blood glucose levels, multiple injections, exact measurements of food portions, his intake of all solids and liquids, carb counting, testing urine, etc., he required private-duty nursing when I was not with him. A month after discharge from the hospital, Billy was diagnosed with renal and cardiac disease and required additional medications and intervention. Because of his challenges with communication and extreme developmental delays, his care was very individualized with protocols specific for “Billy.” He was not to be treated as “text-book” diagnoses. In an attempt to keep stress at a minimum, necessary care was slowly integrated into his daily routine, which already was demanding. After a few nurses were hired, they were quickly fired when care was to be provided “their” way, not what was best for Billy. Despite having detailed orders written by physicians and my wishes to make life a little happier and more manageable for Billy, each nurse wanted to modify his regiment. Sadly, they were unwilling to deviate from the “standard” and learn how to maintain his stable status. This resulted in leaving my profession as a court reporter and accounts manager of the firm, after 15 years, so I would be available to provide care for my son. At 47 years old, I wasn’t sure in what direction I would go. I then realized there were parents in need of care for their dependent, beloved pets as I needed for my son; hence, founding my company, I’ve Got the ‘Scoop’!, LLC – Providing Love, Enrichment and Comprehensive Pet Care… as though YOU were there! Why do pet owners choose your business over others in your area; is there something special that attracts your clients? I ask this question of my pet parents, and their responses share many similarities. Our relationship begins when parents view the love displayed in my photos and they tell me it’s obvious how much I care from the first time we speak about their pets. My initial consultation is quite extensive and families’ comfort levels increase more so during that time. I obtain a very thorough history and spend a substantial amount of time inquiring about specific details, observing, playing and interacting with their beloved pets, learning as much as possible. This leads to establishing a bond that only grows stronger with subsequent visits. Often times, a cat considered to be very skittish or a dog with anxiety that normally does not engage with strangers right away, if at all, warm up to me quickly, leaving pet parents astonished. Their worries and anxieties are alleviated. s are safe. I am certified in animal first aid/CPR, participate in continuing education classes and keep up to date with current recalls and product information. Since I do not use independent contractors or hire employees, it’s me, personally, coming to each visit, and parents are confident their pets are extremely well-cared for. They are assured of my secure backup plan in the event of an unforeseen emergency, and most of my lovies have already met the only person I trust with them, my fiancé, Dan. He is incredibly patient, compassionate, loving, observant and meticulous with details, and joins me during visits, in advance, so he’s not a stranger and is familiar with their routine if he is needed. Parents have peace of mind knowing I’ll be available to communicate with detailed updates. I ask for clarification, if needed, and technology has not taken over the personal service I provide to my families. They also appreciate how I limit the number of pets on my schedule each day to allow for lengthy visits. I spend quality time with my furry babies, becoming well aware of their individual needs, what makes them happy, feel loved and secure, and how the time their family is away may be most enriching and fun. the same; it’s very comprehensive, not just walking and feeding or scooping a litter box and leaving. We have spa days with preventative care, brushing hair and teeth, even cleaning ears and clipping nails if needed, extended walks or playtime, and lots of lap time full of hugs and kisses. Families’ security and privacy are taken very seriously, as well as the safety and well-being of animals in my care. I am very attentive to accommodating special requests and following detailed instructions others may feel are extreme or unnecessary. Parents feel very confident with my thoroughness and abilities, and have peace of mind when their pets are in my care. My precious kitty, Simon, had special needs, as well as my son, and it is because of he and Billy I understand the significance of small details, observant of nonverbal communication, aware of changes in routine and behavior of my furry babies, and highly respect the wishes of every pet parent as I wish a nurse to do for my son! This all contributes to providing a higher quality of care which should be the standard practice of every pet sitter. What are some of the most useful advertising tools that you have used? I’m not fond of the word “advertise.” Maybe because I cannot afford an advertising budget. [Laughing] Most say a business must have one; I disagree. My passion for animals, knowledge and willingness to help all pet parents, not just clients, and networking with other pet professionals, earned me the reputation as a professional pet sitter and resource in my community. People refer me by sharing their experiences and the exceptional care I provide for their pets, as well as the photos I send to parents display all of the love and fun we share. Volunteering your time and becoming known as the expert pet sitter in your community is most rewarding. How has social media impacted your business over the last few years? It consumes too much time! However, social media allows me to reach a larger audience much faster. I’m not good at sending quick messages, as I like my communication to be personable. This tends to delay getting information out because of having to sit and write detailed emails. With social media, providing pertinent information can be done expeditiously by sharing a post or an article; whether it’s alerting everyone to recall information, outbreak of infectious disease, wellness information, a lost pet in the community, health-related studies, seasonal tips to help protect our pets, a fundraising or adoption event. It’s a quick way to share information from which others may benefit. Do you have any general advice for new pet sitters? If you wish to become a Professional Pet Sitter, you must earn the title and always respect it!!! Credentials are vital! You should maintain current credentials and documentation to provide at every consultation: A passed background check, Certificate of Insurance for commercial liability coverage and any licenses and registrations. I personally would not enter anyone’s home or provide any services until adequate insurance is obtained. I am not an expert in insurance, but highly recommend you evaluate the coverage of your policy and be certain you have, at minimum, protection for the following: injury/negligence/loss to animals in your care; injury to any persons and/or pets caused by an animal in your care; theft/negligence/damages to clients’ personal belongings and property. You get what you pay for; lower premiums typically mean lesser coverage. Inquire about local, state and federal laws re: business registration and licenses, to ensure you are operating a legitimate business. Build up your references to include both pet parents and professionals. Obtain Animal First Aid/CPR Certification and participate in continuing education. Be prepared for an emergency, as your intervention may very likely save an animal’s life in your care. Allow sufficient time for each pet’s visit or you will compromise the quality of care you provide. If you are uncomfortable with a request for medical care or administration of medication, or have questions, contact the treating veterinarian. I always obtain verification from their vet if medication is to be given in the absence of a current prescription. I would not provide care if it makes you uncomfortable. Trust your instincts if there are red flags and respectfully decline to provide services. That was another piece of advice I was given: You do not have to work with every family that contacts you. The distance may be too far; you may not agree with training techniques; the home may be unsanitary; a family cancels too often or fails to pay for your services. Remember, it’s your business and the choice is yours. Network with other professionals. Observe new situations when possible and be receptive to learning from those willing to help you advance with continuing your education. Develop relationships with veterinarians who foster wellness, are willing to teach you new skills and answer your questions to ensure continuity of care for mutual clients. I am so thankful for local veterinary practices whom are always willing to help. Establish a presence in your community. Get involved. Help raise awareness and support a local charity. There are various ways to help other than making monetary donations. Make a difference in a family’s life by spending extra time with a beloved pet during end of life, donate your services and provide care from your heart for someone during a crisis, purchase food and supplies for a family in need…show how caring professional pet sitters are by helping a family and their furry loves. If monetary gain far exceeds your desire to create betterment in the care of animals, seek out a different position and leave the hands-on care to others. Always manage your business the way you choose to, rather than being influenced or discouraged by other pet sitters: Hours, rates, growth of your company, remaining a sole-practitioner, services you offer, use of technology, types of payments accepted, are decisions you make. Don’t be afraid to do things differently or bark louder… just make a difference and be puuuurrfectly proud of yourself for becoming a Professional Pet Sitter!!! “You mentioned mandates of minimum standards for professional pet sitters; can you tell us about that? Due to low standards, lack of ethics and no oversight in pet care, it’s led to gross negligence, often times death. Early in 2015, I reached out to Assemblyman Troy Singleton for help. My goal is to have a licensing and certification process implemented for pet sitters. Assemblyman Singleton was accepted as a co-sponsor of Assembly Bill 2264, Bijou’s Law, and is expanding the Bill to include pet sitters. Suggestions I provided above have been incorporated and I am hopeful the Bill shall be written into law to elevate the standard of care provided by all professional pet sitters and protect families’ property, personal belongings and precious pets. How can someone reach you if they have questions? Do you have a web site? Are you on Facebook? I’d love to hear from anyone who has questions! My web site is http://www.IveGotTheScoop.net and My Facebook Page is http://www.Facebook.com/IveGotTheScoopLLC. 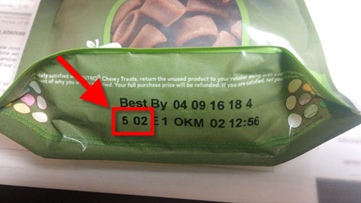 Pet Food Recall: MARS Petcare Nutro Chewy Treats Apple 4 oz. MARS Petcare has issued a voluntary recall of its Nutro Chewy Treats Apple 4 oz. The recall information is below. It was found at PetSmart. MARS Petcare has issued a voluntary recall of the following Nutro dog treat due to potential mold. Lots codes beginning with ‘4 50’, ‘5 02’, ‘5 03’, OR ‘5 05’ (regardless of best by date). 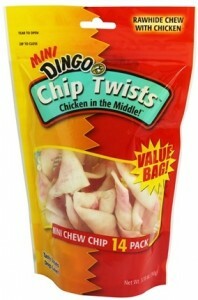 Please stop feeding this product to your pet and bring any remaining Nutro 4 oz. Apple Chewy Treats affected by this recall to your nearest PetSmart for a full refund. PetSmart sells a wide variety of treats from many brands, and our associates can help you find the right item for you and your pet. If you have questions about this voluntary recall, please contact Nutro Customer Service at 1-800-833-5330. Because this recall is a Class III recall, the company does NOT have to make it public. Helping to keep beloved furry babies healthy and safe… and pet parents informed! 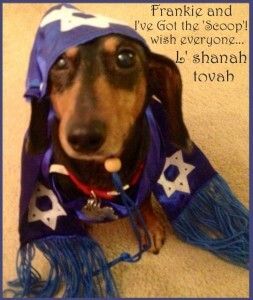 Rosh Hashanah (Happy New Year) Wishes from a Furry Friend of Mine… Frankie! Wondering what your Jewish Pet Parents are celebrating? Here is a Rosh Hashanah “cheat sheet” written by Wendy Thomas Russell on PBS Newshour. Date: The 1st and 2nd of the month of Tishrei in the Hebrew calendar. In 2015, the holiday starts at sunset Sept. 13 and ends at nightfall Sept. 15. Not to be confused with: Yom Kippur, which occurs 10 days later. The good stuff: Foodwise, this holiday is associated with apples and honey (symbolizing a sweet new year), as well as pomegranates and challah (braided bread). Also, in lieu of stupid hats and tasseled squawkers, celebrants sport the traditional yarmulke and blow a cool-looking horn called a shofar. May you be Inscribed in the Book of Life! “The 2015 America’s Favorite Veterinarian Contest has been halted, and we have declared all 20 finalists “America’s Favorite Veterinarians” following a vicious cyber-bullying attack which disrupted and contaminated the final election process. Activists opposed to cat declawing “hijacked” the contest, resorting to cyber-bullying the majority of the contest finalists. The attacks were reprehensible and undeserved, and have undermined the spirit of the competition and caused the contestants undue harm. Read the press release for more information.